@PermaTywi came for a #ForestGarden tour on Saturday, about a dozen, everyone seemed to enjoy themselves! The talk went down well I think, although I do try to squeeze everything in to an hour, so it inevitably bursts the seams of time and spills into an hour and a half. 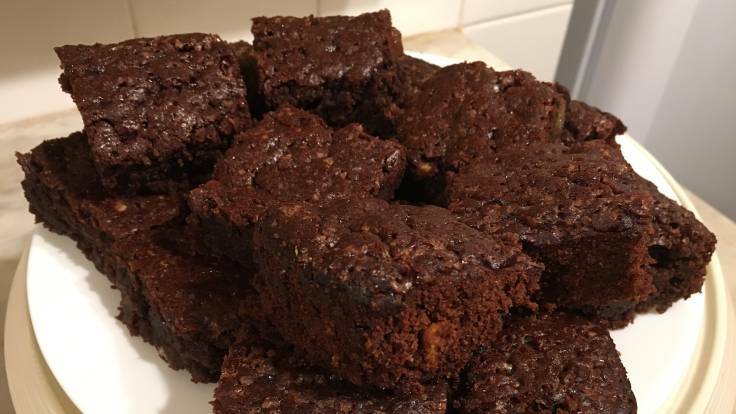 Luckily, people had fuelled up on the famous vegan chocolate brownies (pictured). One of the great things with talking about what you’ve learned is that you receive more ideas and inspirations in return. One chap mentioned non-woven geotextile mulch as an alternative to woven sheet mulch, Paul Jennings talked about cut and drop mulching, Chris used to be a garden designer and has inspired me to find out more about surveying methods and CAD. It’s a privilege to share knowledge with such an interesting and engaged group of invdividuals 🙂.